Here is a good article from the Wall Street Journal that I read last week that gives some practical advice of when antibiotics are indicated and the perils of overuse. Getty Images Overuse of antibiotics, and prescribing broad-spectrum drugs when they aren’t needed, can cause a range of problems. Doctors aren’t only handing out too many antibiotics, they also are frequently prescribing the wrong ones, researchers and public-health officials say. Recent studies have shown that doctors are overprescribing broad-spectrum antibiotics, sometimes called the big guns, that kill a wide swath of both good and bad bacteria in the body. Instead, narrow-spectrum antibiotics, like penicillin, amoxicillin and cephalexin, can usually clear up many infections, while targeting a smaller number of bacteria. 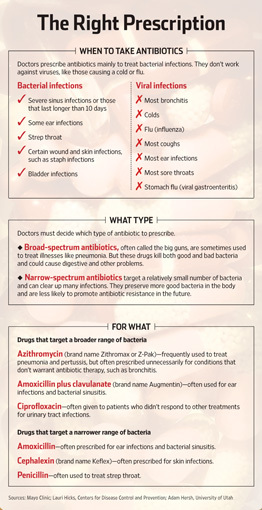 Professional organizations, including the American Academy of Pediatrics, and public-health groups such as the Centers for Disease Control and Prevention are pushing doctors to limit the use of broad-spectrum antibiotics. Among the most common broad-spectrum antibiotics are ciprofloxacin and levofloxacin—a class of drugs known as fluoroquinolones—and azithromycin, which is sold by one drug maker under the brand name Zithromax, or Z-Pak. Overuse of antibiotics, and prescribing broad-spectrum drugs when they aren’t needed, can cause a range of problems. It can make the drugs less effective against the bacteria they are intended to treat by fostering the growth of antibiotic-resistant infections. And it can wipe out the body’s good bacteria, which help digest food, produce vitamins and protect from infections, among other functions. In a July study published in the Journal of Antimicrobial Chemotherapy, researchers from the University of Utah and the CDC found that 60% of the time physicians prescribe antibiotics, they choose broad-spectrum ones. “There is overuse of broad-spectrum antibiotics both in situations where a narrower alternative would be appropriate and in situations where no therapy is indicated at all,” said Adam Hersh, assistant professor of pediatrics at University of Utah and a study author. 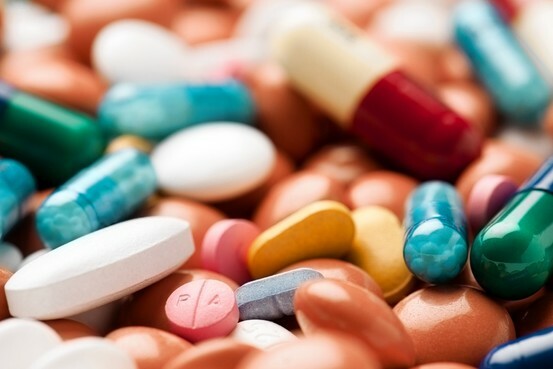 The study, which relied on a public database with information on nearly 240,000 visits to doctor’s offices and emergency departments, said illnesses for which doctors choose the stronger antibiotics include skin infections, urinary-tract infections and respiratory problems. A similar study of children, published in the journal Pediatrics in 2011, found that when antibiotics were prescribed they were broad-spectrum 50% of the time, mainly for respiratory conditions. “This is upward of 30, 40 million prescriptions a year. And on top of it, these are conditions where antibiotics aren’t justified—coughs, colds, bronchitis—and the majority of the antibiotics prescribed are the broad-spectrum antibiotics,” says Dr. Hersh, also a co-author of the Pediatrics study. When doctors don’t know exactly what type of bacteria is causing an infection they may prescribe a broad-spectrum antibiotic. Ordering up a test to isolate the source of the bacteria can take a day or two to get results. Waiting can risk the infection spreading. Patients also may be in discomfort and not willing to wait. Experts say broad-spectrum antibiotics are best used for more severe conditions, such as when a child or adult is in the hospital or has already had multiple courses of antibiotics that didn’t work. Someone at risk for infection with resistant bacteria because of repetitive or prolonged antibiotic exposure, such as recurrent ear infections, might also fare better with a broad-spectrum drug. Charles Cutler, an internist near Philadelphia, says women with recurring urinary-tract infections frequently request broad-spectrum drugs like ciprofloxacin because it is what they know. But the overprescription of such drugs has created a lot of resistant infections, he says. It can take 48 hours for a test to determine what is causing a urinary-tract infection and “doctors and patients don’t want to wait 48 hours,” says Dr. Cutler, who is chairman of the American College of Physicians’ Board of Regents. Bronchitis is another illness for which antibiotics are often overused, says Lauri Hicks, medical director for the CDC’s “Get Smart: Know When Antibiotics Work” program. Eighty percent of the time patients come into a doctor’s office with acute bronchitis they will be prescribed an antibiotic, and usually a broad-spectrum one, she says. “Bronchitis in someone who’s otherwise healthy typically gets better on its own,” she says. Doctors say it can be difficult to tell a bacterial infection from a viral one. A general rule of thumb with sinus infections is to hold off on the early use of antibiotics but consider using them if symptoms persist. Infections like bronchitis, which is mostly caused by a virus, and pneumonia are usually diagnosed by listening to lungs with a stethoscope. If there is doubt, X-rays can often tell the difference. Experts say patients should question their doctors about the use of antibiotics—both whether they are warranted and why a particular type is chosen. The American Academy of Pediatrics has emphasized the importance of judicious use of antibiotics. The group this year updated guidelines for treating sinusitis and ear infections to help physicians determine which illnesses will respond to antibiotics and which type of antibiotic to prescribe. Both updates recommended the narrow-spectrum amoxicillin as a first-line treatment when antibiotics are warranted. Resistant bacteria are often present in the body in small numbers to begin with but are crowded out by other bacteria that are more susceptible to antibiotics. When a person takes an antibiotic, it kills off the susceptible bacteria, allowing the resistant bacteria to grow more easily, says Dr. Hersh. Jeffrey Gerber, a pediatric infectious-disease specialist at the Children’s Hospital of Philadelphia, recently led a research team exploring whether doctors’ prescribing habits could change. The researchers looked at 18 primary-care pediatric offices. In half of the offices, doctors received on-site education about prescribing guidelines for some common infections: pneumonia, strep throat and sinus infections. Narrow-spectrum antibiotics were recommended for all three conditions. The other offices didn’t receive any guidance. “After 12 months we saw overall a nearly 50% reduction in broad spectrum or off-guideline prescribing for these conditions” in the intervention group of offices compared with the control group, Dr. Gerber said. The study appeared in the June issue of the Journal of the American Medical Association. He said the researchers are currently examining what effect the change in prescribing habits had on illness control, cost and other outcomes.